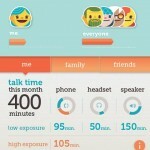 Empowering you to live a lifestyle focused on health & fitness, tawkon is a free health tracker app that alerts you when phone radiation spikes, and offers practical advice to help you avoid it. Download tawkon, so you can talk on. 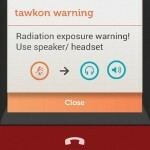 √ Phone Tracking and Alerts: tawkon is a health tracker that lets you know when your phone emits higher than normal levels of radiation, using a metric called SAR (Specific Absorption Rate), so you can talk on safely. 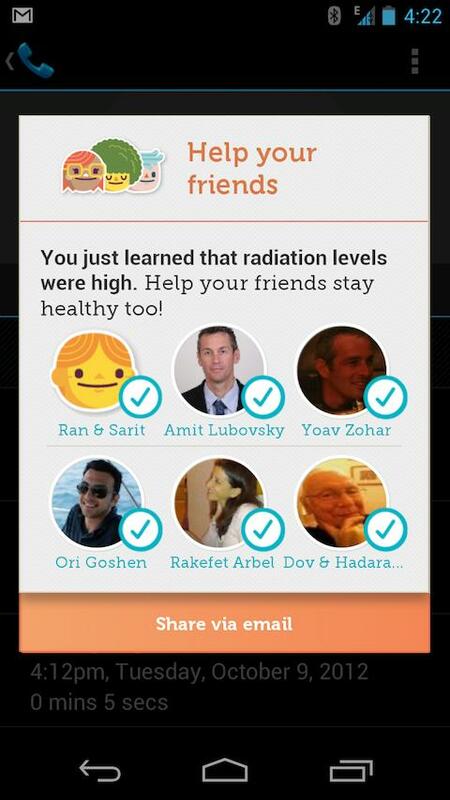 tawkon also tracks your phone usage behavior over time and lets you know how much radiation you have been exposed. 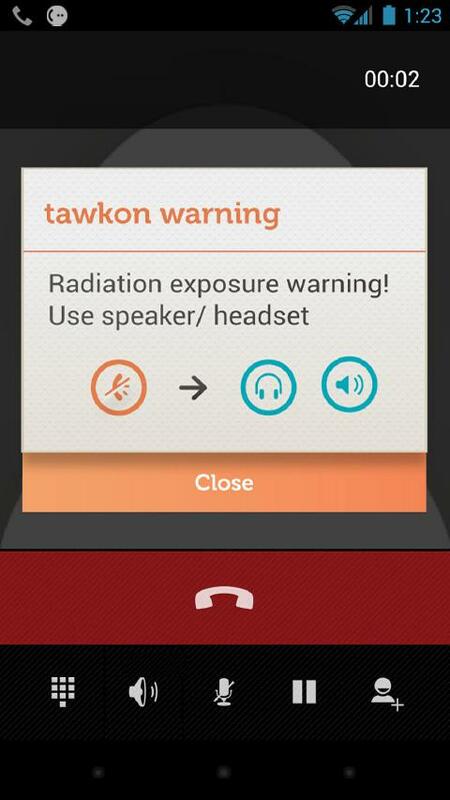 √ Suggestions: When SAR gets high, tawkon will suggest alternative ways to lessen your exposure – such as using a headset. 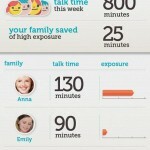 √ Parental Control: tawkon is a parental control health tracker app. 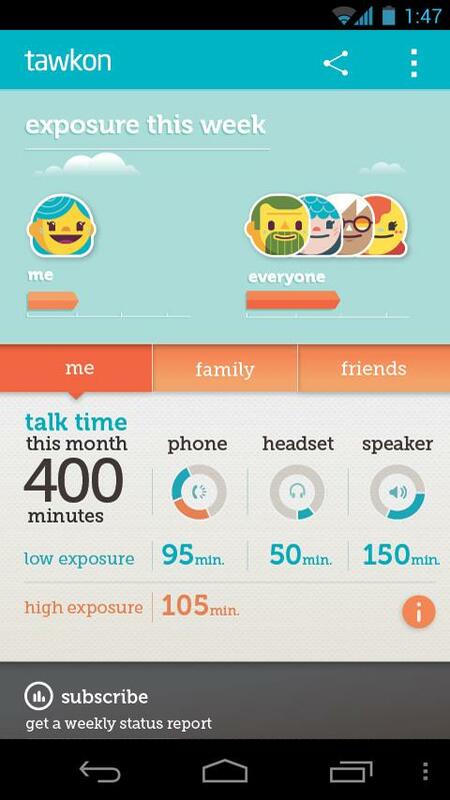 As a parent, your personal tawkon dashboard gives you full access to charts and statistics of your kids’ talk time and exposure to radiation. All you have to do is invite them to download tawkon via the “Family” tab. 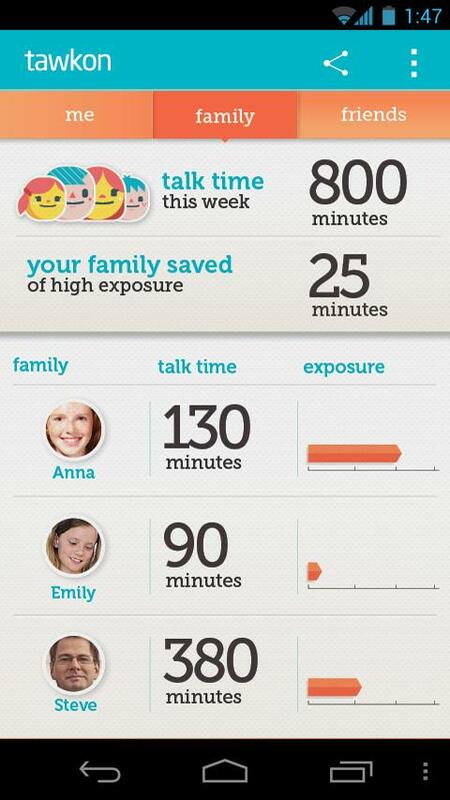 As a health tracker, tawkon not only helps keep you safe, it helps keep your family safe. 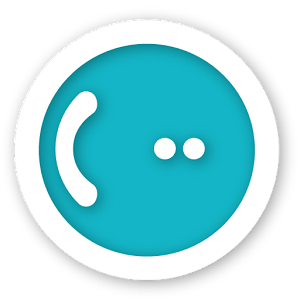 √ Social: You can invite family or friends from your phone’s contact list to connect with you within tawkon. 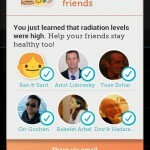 The app lets you share your readings with them, as well as tips on avoiding excessive exposure. With tawkon, you can motivate your friends to live a health conscious lifestyle. √ Weekly Report: The weekly report – sent via email – is more comprehensive and delivers useful usage tips in addition to the basic information you see in the application dashboard. tawkon is power efficient and totally non-intrusive. The app runs in the background only during a call. Since the two main components that drain battery power are the phone’s display and transmitter, if you talk wisely and act according to takwon’s suggestions, you can actually extend your battery life. Mobile phones transmit information to cell towers and antennas. When you are farther away from these towers, your phone works harder for a signal, which causes it to emit more radiation. Additionally, factors such as the distance of the phone from your head, poor signal strength as well as others, play a part in this equation as well. Our radiation health tracker application analyzes communication components within your phone and other physical factors and predicts the level of radiation in real time. Based on universally accepted international SAR (Specific Absorption Rate) standards, the app provides contextual alerts when the user can take action to avoid high exposure. Once you’ve made the suggested changes, tawkon confirms that you are once again safe, in low SAR and ready to “talk on”. We are asking for permissions to intercept outgoing calls and call phone numbers. We ask for this to be able to warn you about high exposure situation before a call is made or received. In addition, we ask to access your personal information and read contacts to allow you to easily invite your friends & family to share your exposure & talk time with them.